On the July 10, 1981, Most. Rev. Dr. S. Michael Augustine, till then Auxiliary Bishop of Madras – Mylapore, was nominated as the fourth Bishop of the Diocese of Vellore. The Installation service took place on July 24, 1981 at 6.00 p.m. in the Cathedral Campus at Vellore. Bishop S. Michael Augustine was the Bishop of Vellore for 10 years and 11 months. During his tenure of office, about 100 churches and chapels were built; seven new parishes were erected, six convents and dispensaries and three High Schools were opened, and five Elementary Schools were upgraded to middle schools. He noticed that Catholics do not hold high positions. To achieve this, He started summer coaching classes for the students who finished school. This coaching classes helped many people to go for medicine, nursing, engineering and other technical trainings. He has also established a scholarship fund for professional studies. The children should have strong foundation in their education. So he started coaching classes for High School children. The coaching classes were conducted for a month. The whole expenses were met by the projects and Diocesan contributions. The future of the Diocese depends upon the priests we get. To foster local vocations, he started a minor seminary at Pathiavaram. As the Tamil Nadu Bishops decided to have the college education as minimum qualification for major seminary admission, a seminary was started at Koviloor. The students attend Sacred Heart College, Tirupattur. At present, The minor seminary is at Vepur. Only students who have finished their plus two (+2) studies are admitted. After two years of minor seminary course, the students are sent to Tirupattur College for degree course. Home for Homeless: with this view, he built houses for the poor people. A loan scheme was started to help the teachers to build their houses. About 300 teachers have benefited by this scheme. With the help of Austrian youth, four dispensaries were started in interior villages. A Retreat House was started by ‘Foyer de Charite’. This is one of the Power Houses. Several Retreats and Seminars are conducted here. The separated brethren too come here for their spiritual renewal. He was transferred as Archbishop of Pondicherry – Cuddalore on March 24, 1992. He remained administrator of Vellore Diocese till June 25, 1992. When Bishop Michael Augustine took charge of Pondicherry Archdiocese, the Diocese of Vellore became vacant. The Diocesan Consultors had their meeting and elected, Rev. Msgr. 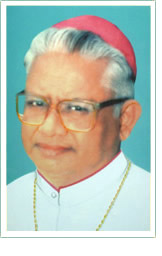 A. Nambikairaj as the Administrator of the Diocese of Vellore. The diocese was ably administered by him for 20 months.